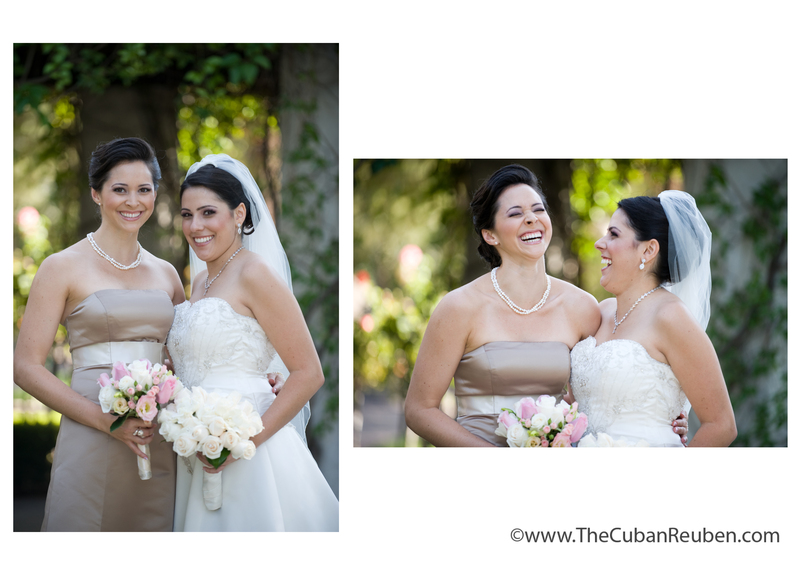 I’ve always found it fitting that the term in Spanish for first cousin, prima hermana, literally translates to cousin sister. 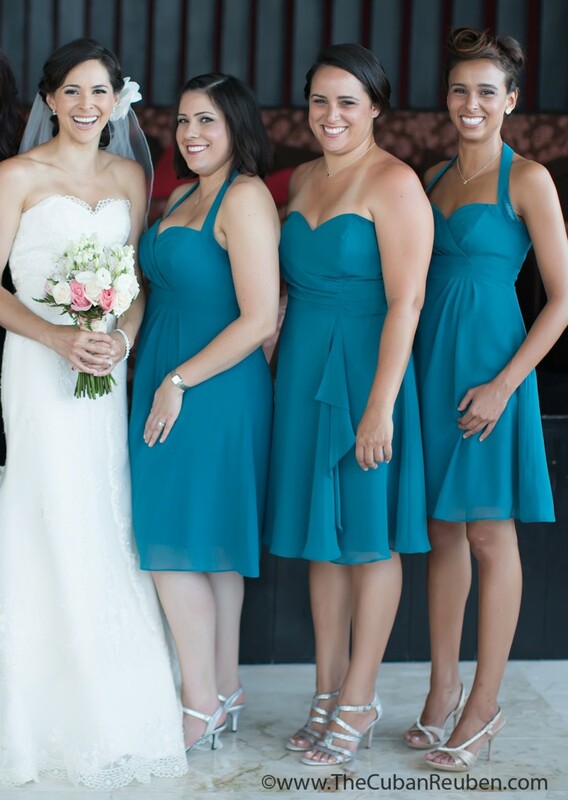 While separated only by distance, my maternal cousins have always felt more like sisters than anything else, and were treated as such, for better or for worse. My younger cousin, Christine, the baby in the bunch, bore the brunt of most of the family pranks and teases. Although, she made it easy, when she claimed she came from the planet “Petwee,” and kept up the facade for a good many years. As someone known for marching to the beat of her own drum, she’s had an independent spirit for as long as I can remember, and has since grown into a real trailblazer. I like to think that our casting her as the “booger girl” in our home-made music video back in the day helped to thicken her skin a little, and prepare her for her world travels. If nothing else, it makes for good campfire stories. My older cousin, Leanne, who influenced my taste in music (ahem, Gloria Estefan) and shared my appreciation for a certain boy-bander (ahem, Jordan Knight), was the older sister I always wanted. I’m pretty sure her natural curls are responsible for a few of my ridiculously failed perms back in the day. As the leader of the pack, and built-in babysitter, Leanne was often tasked with judging the kids’ family dance competitions, while the adults indulged in a little Sabado Gigante in the other room. Us youngsters trusted her judgement and wisdom, and we knew that her word was law. Those arbitrating skills have not gone to waste, as she grew up to be a well-respected attorney. And then there’s Maureen, the cousin with whom I am closest in age. When we weren’t recreating the choreography from Dirty Dancing and the Rhythm Nation video, or perfecting our makeover skills with over-the-top hair and makeup that looked more like we were preparing for war, we were slip-sliding our way across wet floors, despite my Aunt’s clear warning that “el piso esta mojado! !” (Read: The floor is really wet!). Maureen was the first to identify my old lady tendencies, and to call me out on being a 65-year-old trapped in a 12-year-old’s body. We’d stay up late, philosophizing the wonders of the world and giggling until our bellies ached, but at the end of the day, she just got me. While we don’t get to see each other as much these days, whenever we get together, it’s as if no time has passed, and we pick up right where we left off. Combining the wet and dry ingredients. On a recent visit to Maureen’s neck of the woods, she and I had a deep conversation about the therapeutic qualities of working with our hands. As a trained Physical Therapist, Maureen knows a thing or two about working with her hands, but it wasn’t this type of work that we were discussing. There’s something about using ones own skills, strength, and talents to produce a product for the sole enjoyment of someone else. And the fact that whatever you made was handmade, means that your gift is completely one-of-a-kind, and made with love. For me, you can really see this philosophy when I entertain, and go above and beyond my normal weekday fare to make my guests feel acknowledged and appreciated. For Maureen, it’s her new venture into the world of custom Letterpress. With each order, Maureen creatively creates a specific design, and using an old letterpress, she painstakingly cranks out each piece by hand. The oats mixture, ready for the oven. With the recent launch of MadeByMaureen.com, I thought it would be fitting to present a recipe initially shared with me by Maureen, herself. 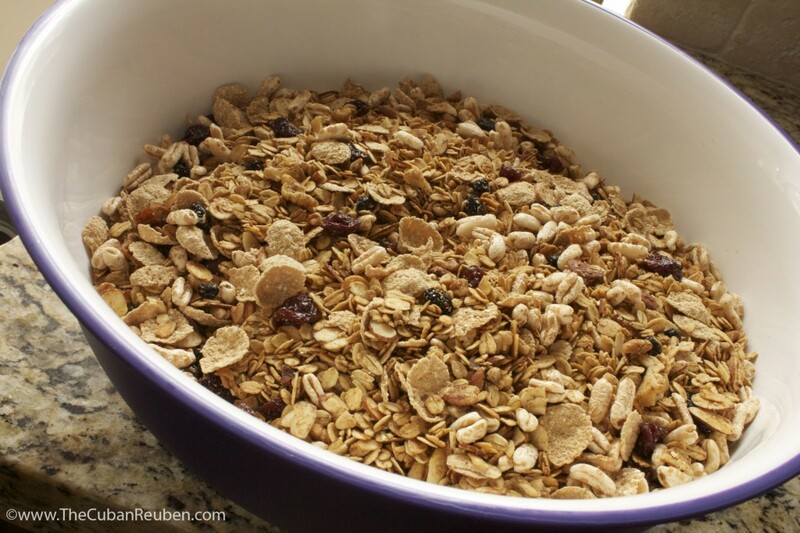 I can certainly see why someone would choose the convenience of buying a box of cereal at the market over making some yourself, but after tasting one bowlful of this homemade variety, you might just change your mind. Rich in protein and high in fiber, this is the only cereal that has ever kept me satisfied for an extended period of time. While the list of ingredients calls solely for whole foods, it may seem like the “healthy” cereals you remember that taste like dust and air, but don’t let that fool you. With just the right amount of honey-kissed sweetness and the chewy bite from the dried fruit, I don’t miss the sugar cereals one bit. My mother-in-law likes to grab a dry handful for a snack on the go, but I prefer the more traditional route served in a bowl with cold milk. Even my 18-month-old nephew, Eli, gave this recipe his stamp of approval with an audible “Mmmmm” after a little taste. Clearly, he is developing a discerning palate with that critique! Since Maureen and I have a tendency to gift much of our batches away, we appreciate the fact that this simple recipe produces quite a bit of cereal. 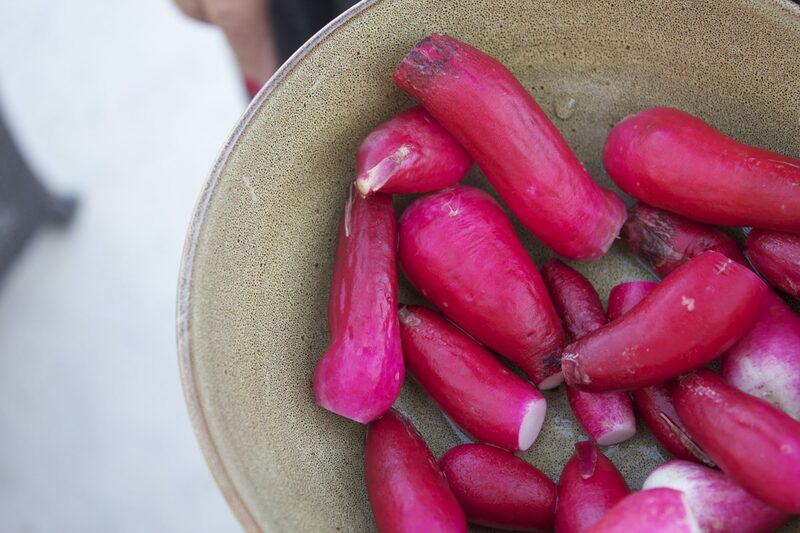 We also love the fact that the core recipe is easily adaptable to the seasons. Looking for a Fall flavor? How about maple and cinnamon paired with pepitas and pecans? Want something more geared towards Winter? How about adding a bit of cocoa powder, to remind you of a cup of warm hot chocolate? There’s really no wrong way to mix and match nuts, fruit and spices, and I urge you to experiment to find the combination you like best. High in protein and fiber, this cereal keeps you satisfied all morning long. In a small saucepan over low flame, heat the coconut oil, honey, vanilla extract, salt, and cinnamon, stirring constantly until salt and honey have dissolved. Set aside. In a very large bowl, combine the oats and nuts. Drizzle the oil/honey mixture over the oats and nuts, and stir until completely coated. Spread the mixture evenly over 2 large baking sheets lined with parchment paper or silpats, and bake for 20 minutes. Remove the sheets from the oven. 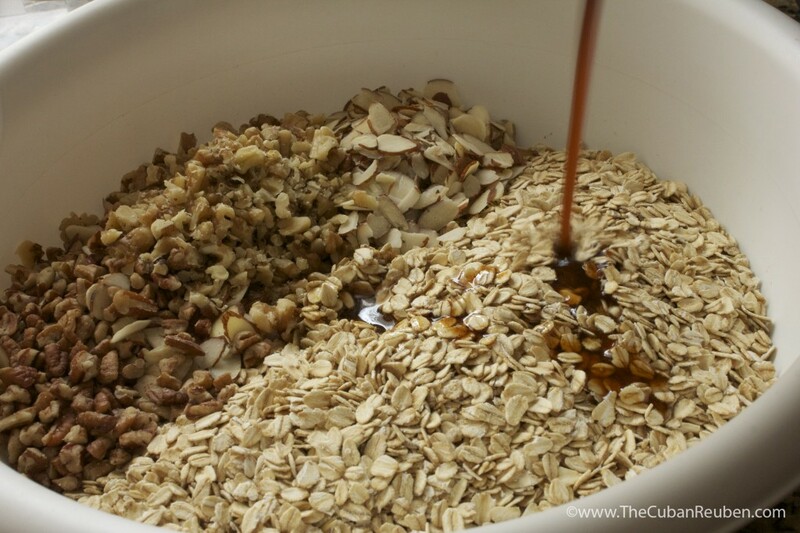 Use a spatula to mix the oats, and re-spread them out evenly. Return the sheets to the oven, and alternate the sheet from the top and bottom racks. Bake for another 10 minutes. 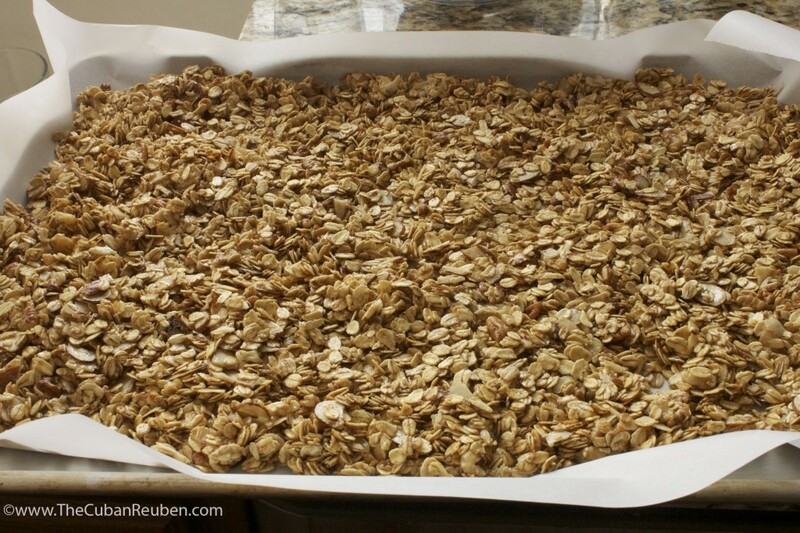 Repeat the previous step every 10 minutes, until oats have reached desired level of browning (about 20-30 minutes). Remove sheets from the oven, and cool. 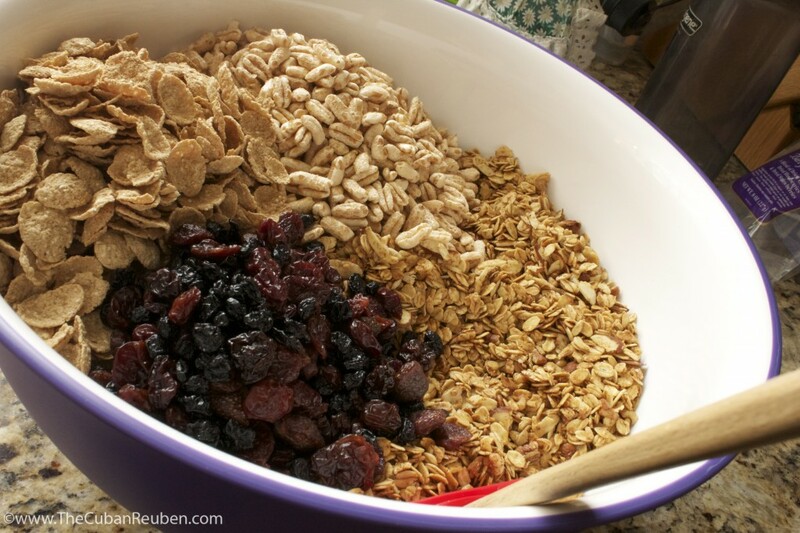 Once cooled, combine the oats mixture with the kamut (or puffed brown rice), bran flakes, and dried fruit. The Jewish High Holidays are quickly approaching, and as it seems like they creep up on us each year, this year is no exception. Today, I have a very special treat that comes straight from one of my mother-in-law’s additions to my family cookbook, and has elevated our Rosh Hashana table for several generations. Everytime I ask Bette Jo, my mother-in-law, about this recipe, a big smile spreads across her face as she remembers the story behind it. It’s amazing how cooking techniques and recipes change over time. My husband’s great-grandmother, Ruth Sunshine, was famous for her plum cake, and it has remained a true family treasure. When Ruth handed down the recipe to Bette Jo, then a newlywed, Bette Jo was shocked to see that there was no mention of specific oven temperature, and that the only mention of cook-time was “bake until done.” Lucky for us here at TheCubanReuben.com, my dedicated mother-in-law tested and tweaked until she determined the missing details in the recipe. Maybe cooks in the old-world had a better sense of their kitchens, but today, baking is a precise science. Our family’s High Holiday feasts would be incomplete without this classic, Eastern European, hand-me-down recipe, and I have yet to try one that comes close to being as good as Bette Jo’s. After a decadent meal, this dessert is the perfect ending, as it is not overly sweet. 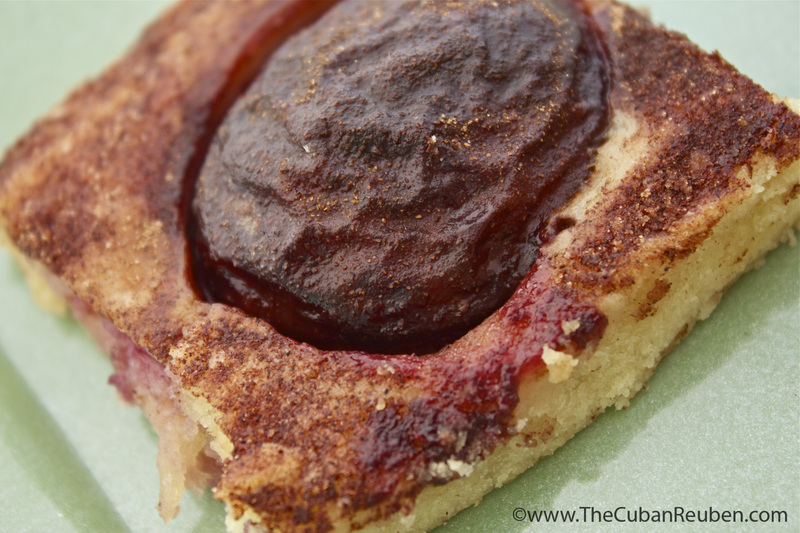 The juice from the plums moistens the thin, dense layer of cake, and the sprinkling of cinnamon perfumes and adorns every bite. I should mention that it is hardly surprising that one of Bette Jo’s most favored dishes includes lots and lots of cinnamon, because this is her signature spice. Each serving of this cake is ornamented with its own plum half sitting like a ruby gemstone sanded with cinnamon and sugar, and according to my sweet-toothed husband, begs to be crowned with a dollop of freshly whipped cream. Although traditionally found on our high holiday menu, this plum cake recipe would also make a perfect pairing with an afternoon tea. Old world, no-fuss approach to a simple and classic dessert. Alternately add flour, baking powder, and milk. Add vanilla. Spread batter in greased jelly roll pan. Lightly sprinkle the top with flour, and place plum halves on cake. Mix sugar and cinnamon topping together, and sprinkle as much as you want on top of cake. Drizzle melted butter over cake. Bake at 300 degrees for ½ hour or until a toothpick comes out clean. This makes a lot of the cinnamon/sugar mixture. You do not need to use all of it. Use what you want, and save the rest for cinnamon toast!